We have gathered the evidence to reveal where in the world you are most likely to die of illness, incidents, accidents… or even falling out of bed. We are all resigned to the fact that death comes to us all in the end. What is far less certain is how we will go. But thanks to the wonder of statistics we can look at the globe in a different way, pinpointing which countries are hotspots for a particular illness, accident or incident. Some are probably predictable, some will surprise you… and just to show that we are not totally morbid, we've included an "old age" marker to show which country you are likely to live the longest. And just a word of note on how to read the map. It does not show what you are most likely to die from in each country of the world - that map would be dominated by cancer, heart disease and car accidents. Instead, it shows you the country with the highest proportion of deaths per million people for a specific type of accident, illness or other cause. 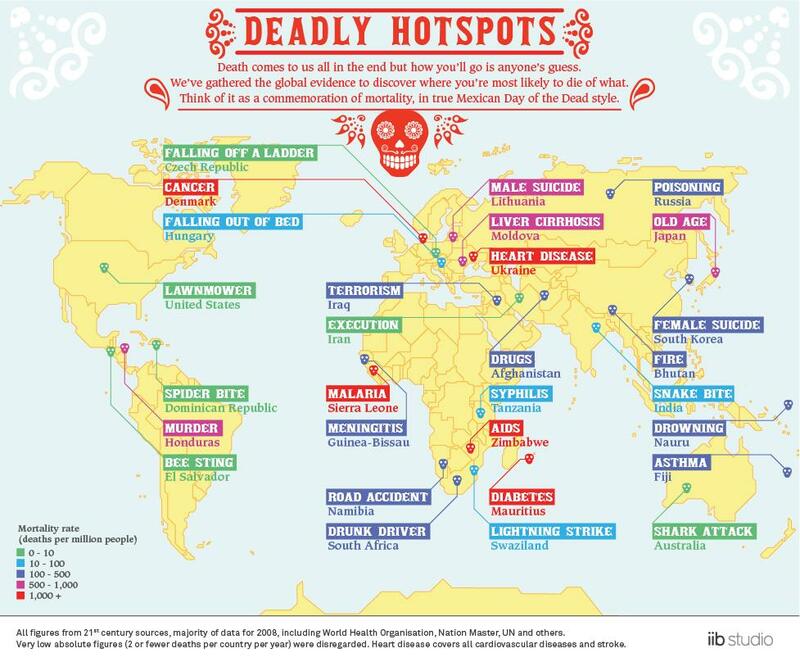 So, for shark attacks, for example, the global hotspot is Australia. Although sharks only account for a small number of total deaths in the country per year, the number, per million head of population, is higher than anywhere else in the world. Similarly, there are more deaths due to road accidents in Namibia, per million people, than any other country in the world. So, click here for our look at the geography of death, Mexican Day-of-the-Dead style.